You Can Now Add Video as Your Facebook Cover—But What Does This Mean for Lawyers? Facebook is rolling out a new feature intended to help you stand out from the social media crowd. Rather than using a static cover image for your law practice page, you can now add a short video. Pretty cool, right? Imagine how engaging it will be for visitors not only to see your face or company logo at the top of your page, but actually get to hear a personal introduction welcoming them to your social media platform! When Will You Be Able to Add Video to Your Facebook Cover Space? When we mentioned “rolling out” above, that’s exactly what we meant. This feature isn’t available across the entire Facebook universe yet, but it may be soon! 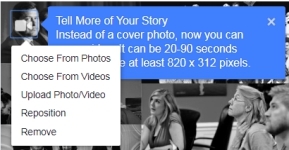 You will need to go to your Facebook Business Manager page to see the new prompt to upload a video cover video. If you don’t see this blue notification yet, don’t worry. You will once Facebook rolls out the feature for everyone. Click the video icon on the top left of your current cover photo and either upload a new video or choose one from your already posted videos. Once you have the opportunity to add video to your cover image, please don’t just toss up whatever video you’ve got lying around. Check out our page to see this new feature live. Facebook provides clear formatting requirements of 820 x 312 pixels. With 20 to 90 seconds to get your point across, make sure you plan in detail what you want to talk about. A quick overview about yourself, your firm, your main practice areas, as well as how visitors can contact you is a great place to start. URLs and phone numbers should be clearly displayed as well. Chances are your competitors won’t be putting in as much effort to add a video to their Facebook cover image, so this is really an opportunity for your practice to shine. You can even use one of the quality videos you’re already using on your website that covers all of the above. You are producing videos for your law firm’s website, aren’t you? The entire team here at Foster Web Marketing is dedicated to keeping you up to date on all the latest upgrades, tips and techniques available to help you increase exposure and generate leads. Call 888-886-0939 for more information on how we can take your marketing to the next level. Should I Host My YouTube Videos on My Own Website?